Since 1850, Emile Henry has produced in France a large range of high quality ceramic cooking utensils. With a 10 year guarantee, our products are made from natural materials and have been designed and manufactured in France, in Southern Burgundy. Controlled production, without waste, is part of our daily commitment: the CO2 expelled from our workshops is particularly low thanks to our modern firing techniques that require less energy. The waste in general is recycled and the water used in production is filtered and used again in the production process.Our dishes have always been produced in France, in Marcigny in the south of Burgundy: it is a tradition and savoir-faire which has been handed down from generation to generation. Each worker prepares his moulds, produces his dishes and signs each one with his initials. We are proud of this responsibility entrusted to each of our workers, which is a pledge of quality for all our production.Traditionally, the cheese fondue has always been made in a ceramic pot, which has been rubbed with garlic beforehand. Prepare your fondue in the kitchen, then bring it to the table on its stand. The ceramic will gently diffuse the heat and keep it hot for the duration of the meal. 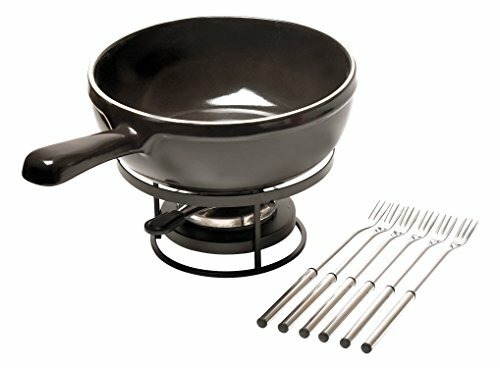 Our fondue set comes with the pot, burner, stand and 6 forks. All Emile Henry products are made in France and offer a ten years guarantee.